When discontinuities in the solar wind remain in contact with a planet's bow shock, they can collect a pool of hot particles that becomes a hot flow anomaly (HFA). An HFA on Venus most likely acts like a vacuum, pulling up parts of the planet’s atmosphere. Strange, gigantic explosions fueled by solar energy detonate just above the surface of Venus, a new study finds. The huge eruptions, known as hot flow anomalies (HFAs), have been seen before near Earth, Saturn and possibly Mars. But the new observation is the first unambiguous confirmation of the phenomenon on Venus, researchers said. It also shows that HFAs there are far different than what happens near our planet, which has a strong magnetic field, they added. "At Venus, since there's no protective magnetic field, the explosion happens right above the surface of the planet," study lead author Glyn Collinson, of NASA’s Goddard Space Flight Center in Greenbelt, Md., said in a statement. HFAs are caused by discontinuities in the solar wind, the million-mph flow of charged particles that streams from the sun. Sometimes these discontinuities — areas where the wind's magnetic fields change direction sharply and abruptly — align with the wind's flow. In this case, they remain in contact with the bow shock, the place where the solar wind slows down quickly and diverts around a planet or other large body. "These plasma particles are trapped in place," said study co-author David Sibeck, also of NASA Goddard. "They make a big puddle that gets bigger and bigger, sending out its own shock waves. Everything downstream from that bubble is going to be different than what's upstream." These eruptions of hot plasma are dramatic events that can compress Earth's entire magnetosphere, the protective magnetic bubble surrounding our planet. Such explosions also cause solar particles to flood into Earth's atmosphere near the poles along the planet's magnetic field lines, sometimes generating intense displays of the northern and southern lights. "Hot flow anomalies release so much energy that the solar wind is deflected, and can even move back toward the sun," Sibeck said. "That's a lot of energy when you consider that the solar wind is supersonic — traveling faster than the speed of sound — and the HFA is strong enough to make it turn around." NASA's Messenger spacecraft detected what may have been a Venusian HFA in 2009, while on its way to study the planet Mercury. Collinson and his colleagues wanted to know for sure if Earth's hellishly hot "sister planet" hosts HFAs, so they studied several days' worth of data gathered by the European Space Agency's Venus Express probe. "That may not sound like much," Collinson said. "But a day on Venus is 243 Earth days." The researchers determined that Venus Express flew through an HFA on March 22, 2008, showing conclusively that the phenomenon exists at Venus. But \HFAs likely cause explosions much closer to the surface of Venus than the Earth variety, because Venus lacks a magnetic field. "At Earth, HFAs have a big effect, but don't necessarily rule the roost," Collinson said. "But at Venus, since the HFA happens right up next to the planet, it is going to have a more dramatic effect on the system." 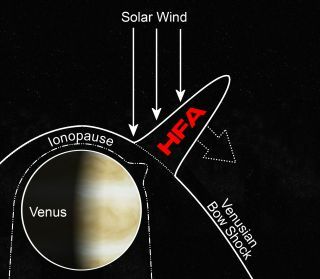 While the researchers think Venusian HFAs probably push part of the planet's atmosphere out into space, they'd need a dedicated spacecraft to really nail down the phenomenon's full effects. But the study does suggest that HFAs may well be common on planets throughout our solar system — and perhaps in other solar systems as well, they said. Collinson and his colleagues published the study online in the Journal of Geophysical Research on Feb. 29.